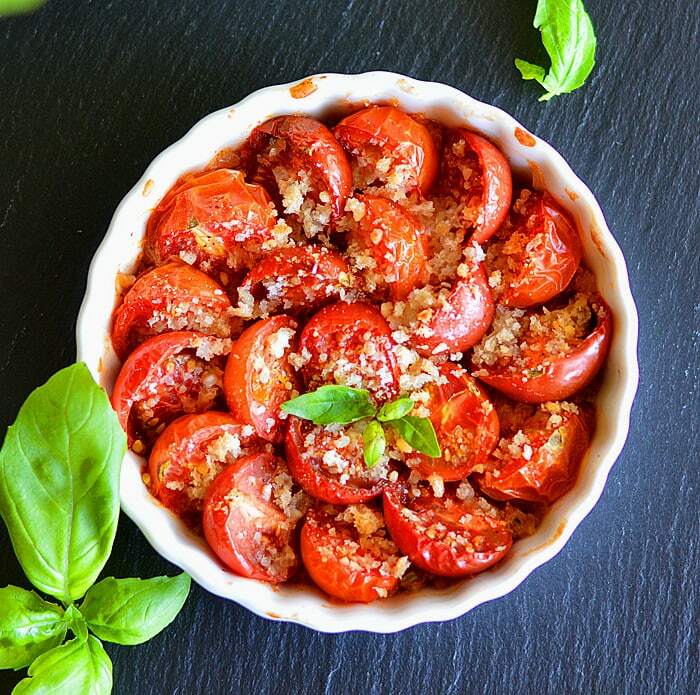 Keeping on the theme of simple is best, I think you’ll love these little individual vegan Tomato Gratin appetizers. Flavor-wise, think Caprese without the mozzarella. You could, of course, make a larger version and serve family-style. Tri-colored cherry tomatoes would be lovely as well. Less than 10 ingredients make up this dish (and that includes salt & pepper)! Let’s make this vegan Tomato Gratin! I layered the shallots & garlic on the bottom of the dish. This is a nice way to add flavor without affecting presentation. Next comes the halved tomatoes that you’ll season with salt and pepper. Lastly, a drizzle of balsamic vinegar and a the topping which is comprised of Panko bread crumbs & vegan parmesan. Bake until tomatoes are bubbling and the topping is golden brown. These individual ceramic dishes are only oven-safe to 350 degrees, so I just placed them on the top shelf in the oven. They took about 20 minutes or so. I grow my own fresh basil, so I sprinkled with a few sprigs on top. Allow to cool slightly and serve warm. Season with additional salt or pepper, if desired. This recipe makes 2 individual sized portions. Just double/triple the recipe to serve family-style. Scatter the minced shallots & garlic evenly in the bottom of the two baking dishes. No oil necessary. Arrange the tomatoes over the top, staggering them as shown in the photo. Season with the salt and pepper and drizzle the balsamic. Combine the vegan parmesan and breadcrumbs and sprinkle over the tomatoes. Bake until bubbly and the breadcrumbs are golden. Allow to cool slightly. I printed this recipe … it looks delicious. It will work well for my WW program.